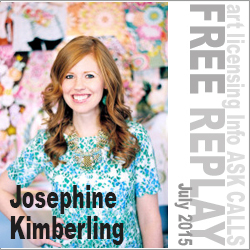 Josephine Kimberling’s artistic talent has been cultivated through 10 years in the fashion industry, by creating hundreds of patterns for Nordstorm product lines, as well as designing her own prints for sale worldwide. Along with her work in the fashion industry, she designed stationery and gift-wrap products for one of the most well-known card manufacturers in the world – Hallmark. Her work has appeared on fabrics, stationery, home décor, wall art, fashion accessories, tabletop, gift products . . . and even cake! Josephine shares her exiting and unique journey into art licensing, and the benefits she has found through her background as an in-house designer. In addition, she discusses how she stays relevant in a changing market, and her recommendations for anyone starting in art licensing today.